The wearable medical device landscape is changing rapidly. An increasing number of medical devices that have traditionally stayed in place are becoming mobile, allowing people to go about their daily lives while the devices do their jobs. Making this vision come true will call upon people to be quite inventive regarding electromechanical and computing matters, but also from a user interface design, and more broadly, user experience design perspective. 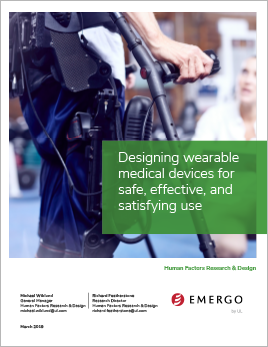 Therefore, wearable medical device developers are well-served to make significant investments in human factors. Click the button below to request your copy of this white paper.